A Look Back at Our 2017 Auction! 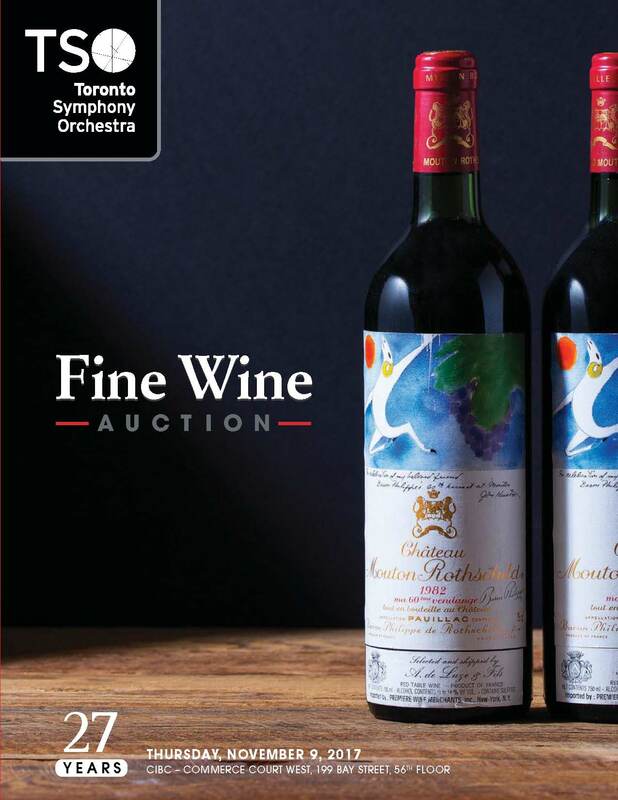 View/download the 2017 TSO Fine Wine Auction catalogue (PDF 11.5 MB). View/download the 2017 CATALOGUE ERRATA (PDF 109 KB). View Photos of the 2017 wine lots housed in Iron Gate Private Wine Management’s wine storage facility. • Our largest collection to date of excellent Burgundy and Rhône wines from 1961 to 2012, including the 1993 and 1996 Armand Rousseau Chambertin Grand Cru, Hermitage and Châteauneuf-du-Pape. • A large collection of French champagne from 1978 to 1996 including the extraordinary 1990 Louis Roederer Cristal and 1996 Louis Roederer Cristal Brut magnums. • A selection of ports and cognac including a 1900 Madeira. • From the cellar of Donald Ziraldo (co-founder of Inniskillin), a unique and special Canadian icewine vertical from 1984-2016 in a hinged wooden case. It includes the famed 1989 Inniskillin Vidal Icewine and 2014 Ziraldo Estate Vidal Icewine, winners of one of the world’s most prestigious wine awards at Vinexpo, Bordeaux, France. The TSO Fine Wine Charity Auction is a project of the Toronto Symphony Volunteer Committee.